What Makes a Great Shakespearean? Tastes in acting, as in everything else, certainly vary, but a great Shakespearean performance is easy to spot. You know one when you see one, although it’s probably more accurate to say that you know one when you don’t see one: when the language no longer feels remote, when the humanity of the actor and the character seem indivisible, when the emotion being expressed is no longer veiled by poetic phrasing but revealed by it, creating a shock of recognition in your own heart. A sterling example is Mark Rylance’s Olivia in the current Broadway production of “Twelfth Night.” The surface trappings of Mr. Rylance’s performance might seem to heighten the sense of falsity that can often prickle and distract us when we are watching Shakespeare. Mr. Rylance is, after all, clearly a man playing a female role — a convention drawn from the Elizabethan era, but one that in our day almost inevitably draws attention to itself. His face is plastered in white makeup and served on the platter of a stiff ruff around his neck. A pouf of hair like a charcoal brioche is coiled atop his head. 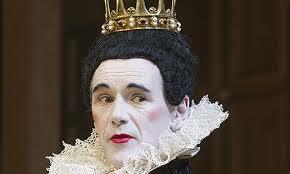 The movement, too, is stylized: Gliding across the stage, Mr. Rylance seems to have roller skates under his black gown. And yet when Mr. Rylance’s Olivia opens her mouth to speak, the melancholy in her voice and the air of distracted grief are so palpable that the carapace of theatricality quietly evaporates; before us is a woman in mourning, who will soon be transformed into a woman unsettled by stirrings of love, later a woman mystified by the apparently unhinged behavior of a servant, and later still a woman amazed and delighted (“Most wonderful!”) at the strange revelations that bring this most bewitching of Shakespeare comedies to a happy conclusion. Mr. Rylance’s presence on Broadway this season, in “Twelfth Night” and “Richard III” running in repertory, provides a miniature master class in Shakespearean acting. And the preponderance of other Shakespeare productions taking place across the season — with Julie Taymor’s “Midsummer Night’s Dream” just opened and Ethan Hawke in “Macbeth” on the way — offers a chance to consider the different approaches actors take in bringing Shakespeare’s great characters to life. And, of course, to reflect on why some actors excel where others fall short. Tim Carroll, the director of both “Twelfth Night” and “Richard III,” has directed Mr. Rylance in 10 Shakespeare productions dating back more than a decade. What does Mr. Carroll consider to be Mr. Rylance’s particular gift? An “animal cunning” that gives him the ability to “smell the room” and shape his performance accordingly; the “verbal intelligence to understand in a very personal way every word he’s speaking”; and a practical savvy that allows him “to respond to problems with incredible speed,” a necessary attribute in negotiating the complex machinery working inside a Shakespeare play. Having seen Mr. Rylance as Hamlet, Richard II, and the Duke in “Measure for Measure” among other roles, I have always marveled at how he imbues these various characters with a quality I can only call soulfulness, a sense that their interior landscapes are being revealed to us moment by moment. Shakespeare’s characters can seem remote in more studied or stilted performances, but Mr. Rylance always seems to be breathing the same air we do. His tutelage in Shakespeare dates back to his teenage years in Milwaukee, where he first began performing in high school, under a teacher who revered the work of Tyrone Guthrie, one of the great classical directors of his generation. But styles in Shakespearean performance evolve over the years, and Mr. Rylance’s career exemplifies the manner in which ideals become conventions, and are eventually rebelled against. Mr. Rylance said he believes that when he was selected to be the first artistic director of Shakespeare’s Globe, at 35, it was in part because the theater’s founders — notably the American-born Sam Wanamaker, the driving force behind its creation — “wanted to shake things up a bit.” The theater’s mission was to perform Shakespeare’s plays in a manner that evoked as closely as possible the experience of Elizabethan theatergoers. At the same time, Mr. Rylance and his collaborators sought to recreate the more informal style that held sway when Shakespeare’s plays were first presented, when the groundlings would come and go during performances, and the relationship between actors and audience was less distant. The waning of what Mr. Rylance refers to as the “English style” of Shakespearean acting — formal, rhetorical, presentational — has helped to erode the long-ingrained (if not necessarily acknowledged) sense that, when it comes to Shakespeare, it helps if you’re British, and particularly if you train at one of the great London acting academies like the Royal Academy or the Central School of Speech and Drama. If you visit London with any regularity, you can easily fall under the sway of this thinking, particularly since you are likely to pick and choose — or even plan your visits around — only the highly acclaimed Shakespeare productions. The National Theater’s breathtaking “Othello” over the summer, with Rory Kinnear as Iago; Chiwetel Ejiofor’s wrenching Othello at the Donmar Warehouse; a sublimely funny “Much Ado About Nothing,” also at the National, with Simon Russell Beale and Zoe Wanamaker as Benedick and Beatrice: These are among the greatest Shakespeare productions I’ve seen. And yet in recent years, I’ve seen equally superb Shakespeare here in New York, with John Douglas Thompson’s Othello equaling Mr. Ejiofor’s in its intensity of feeling, and a starry “Twelfth Night” in Central Park, featuring an enchanting Anne Hathaway as Viola, that signaled a (happily continuing) return to excellent form for Shakespeare in the Park. Jack O’Brien, who is currently directing Mr. Hawke in “Macbeth” for Lincoln Center Theater, has overseen more than 30 Shakespeare productions, making him among the most experienced of American directors. “I used to think pretty strongly that performing Shakespeare does require a major measure of technique, or training,” Mr. O’Brien said, “because you need to exercise the whole acting mechanism. These are symphonic works. They need a variety of voices. You need a string section and you need brass. Mr. Thompson enrolled at Trinity Repertory Conservatory in Providence, R.I., where his natural ability shone so brightly that he was cast as “Othello” at Trinity Repertory within a few years. Mr. Thompson said he believes that research, training and experience are all invaluable, but as with playing a musical instrument, or singing opera, all that preparation must be set aside, at least intellectually, when the time comes to perform. Harriet Walter, the veteran British actress who just concluded a run as Brutus in Phyllida Lloyd’s all-female “Julius Caesar” at St. Ann’s Warehouse, noted that Shakespeare plays require of actors a variety of skills — and a kind of physical stamina — that other roles do not. She, too, compares it to playing a musical instrument: “You have to have an ability to hear rhythm and to know how to place an emphasis in a string of words, so the meaning comes through,” Ms. Walter said. “You do need technique in terms of breath control. It’s a physical thing. The lung capacity, the energy in your diction.” But she also noted that the “Julius Caesar” company includes actors who do not have years of playing Shakespeare to draw on and yet have found that the writing provides all the clues an actor needs to construct a convincing performance. As my conversations with actors and directors immersed in Shakespeare this season made clear, this simple prescription remains as plainly applicable to his work today as it presumably did when the words were first written: “Both at the first and now,” indeed. We return to his plays — and cherish actors who can bring them to life before us — because no writer has surpassed his gift for observing, and recording, how we live, how we love, why we laugh and cry, how we suffer and die. This entry	was posted on Friday, November 29th, 2013	and is filed under Food for Thought. You can follow any responses to this entry through the RSS 2.0 feed.